Naturally potent ingredients get even your dirtiest dishes sparkly clean, while a dollop of pure vegetable glycerin gives some love to your hands. Just add to warm water and enjoy the sweet smell of our suds. AROMA PROFILE: Beautiful, relaxing lavender meets the lively tang of lime. Add in a little sweet orange and a subtle whisper of pine, and you've never felt happier cleaning. 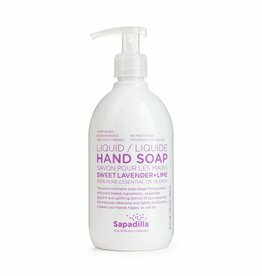 This aroma is irresistable to lavender lovers - and those surprised by the fresh new result when lavender and lime unite. INGREDIENTS: Purified Water, Coco Glucoside, Cocamidopropyl Betaine, Glycerin, Lactic Acid, Ethyl Alcohol, Essential Oils of Peppermint, Rosemary, Clove and Sweet Orange, Xanthan Gum, Potassium Sorbate. AROMA PROFILE: The revitalizing duo of pure peppermint and rosemary pack an oh-so fresh punch, while a touch of orange sweetens the blend. A subtle background of warm, lightly spicy clove is the finishing touch in this heavenly herbaceous blend. AROMA PROFILE: A fresh blend of sweet, citrusy goodness, combining top notes of lemon and litsea cubeba, heart notes of juicy grapefruit and sweet orange, anchored with deep and delicious bergamot. It's nose candy straight from Mother Nature! INGREDIENTS: Purified Water, Coco Glucoside, Cocamidopropyl Betaine, Glycerin, Lactic Acid, Ethyl Alcohol, Essential Oils of Grapefruit, Bergamot, Lemon, Litsea Cubeba and Sweet Orange, Xanthan Gum, Potassium Sorbate.